"I bought this machine [CET Mini-Spa] because we had the very best barrel and pole horse who almost cut his front foot off, meaning he would probably never run again. He managed to compete 8 months after sustaining the injury, but his knee was so swollen he couldn’t put any pressure on it. We had just received the machine and used it on him. Within 2 days I had burst out 3 abscesses and he was walking again. I continued to put him in the machine at least twice a day three times for a week and almost exactly one year after he got hurt my daughter ran him for the first time at a High School Rodeo, where he ran a 19.6 in the poles and was 2nd in barrels out of 70 barrel racers and 65 pole benders. I continued to bring this machine with me and treat all my horses before and after running." "I had the chance to try the Therapeutic Advantage Horse Spa during the World Equestrian Games Selection Trials this year in Wellington. Languster (Nona's Champion Stallion) never jumped better. His legs remained cool and tight throughout the strenuous 6 round event. He enjoyed the treatments and his feet were more comfortable every time he came out of the spa. There is no horse involved in any discipline who wouldn't benefit from the great non-invasive therapy. I highly recommend the spa for all good horsemen." "The greatest horsemen in Europe have always said that for the recovery of leg injuries, whether it be tendon, ligament, suspensory strain or sprain, the best therapy is the sea. For years, people have spent fortunes sending their injured horses to board at lay-up barns near the ocean in order to have them stand in the cold saltwater waves. Now, with the development of the equine hydrotherapy machine the ocean is brought to us. I became familiar with this machine on the Florida circuit 2006. While competing in a Grand Prix one of my horses suffered a slight injury to his ankle. The ankle became puffy and hot and the ultra sound scan revealed a slight tear. After ten days of intense therapy in the ice cold, whirling, saltwater of the hydrotherapy machine my horse's ankle had tightened up and the strain, which had been apparent on the scan, had completely healed. The horse was able to go back to competition almost immediately. Of all the machines that have been developed over the years to help horses recover from leg injuries, I feel that the equine hydrotherapy machine is the very best. It's like going back to nature." 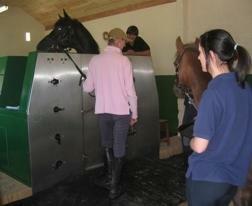 "We are really pleased with the CET Equine Spa. 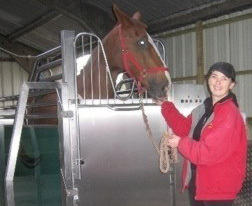 Not only the quality of the Equine Spa is excellent but also the level of support we have received." "I am absolutely delighted with the CET Classic Spa. Everyone has commented how good it looks and the back up support has been brilliant. " 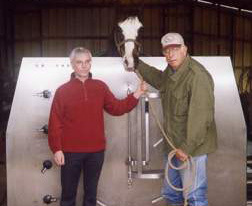 "Installing a CET Equine Spa at our ranch was the best investment we ever made in our horses." 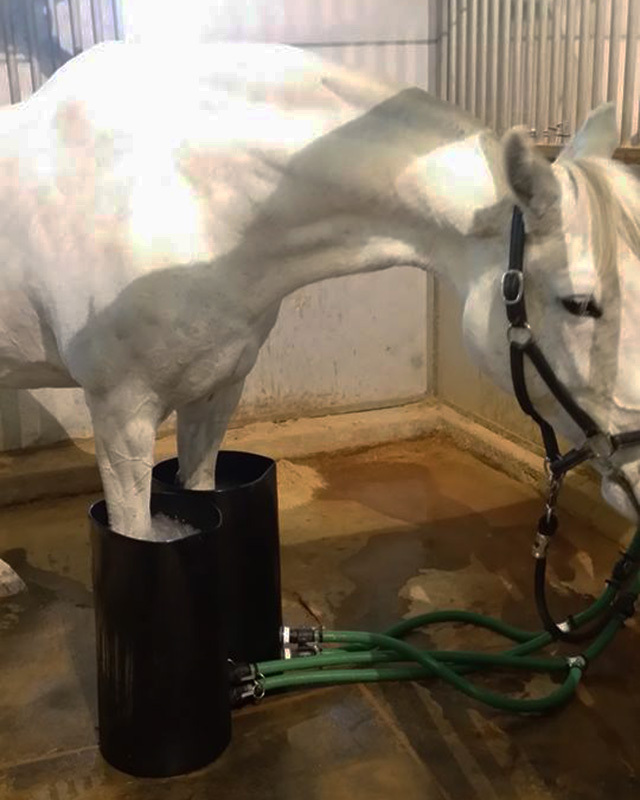 "The CET/ Therapeutic Advantage hydrotherapy spa offers the equine athlete and patient total leg cooling, with their state of the art salinated whirlpool system. Water temperatures can be maintained at 34 degress F to provide the coolness needed to reduce and prevent inflammation of soft tissue in an efficient and specifically engineered system for the horse." "I have had only limited experience with this "salt water spa" for aiding in the healing of soft tissue injuries in horses, but my experience has been very positive. I have seen first hand the beneficial effects on the healing process in both a suspensory branch lesion and on a superficial digital flexor tendon lesion. The healing process proceeded more rapidly and with a better fibre pattern, as confirmed on ultrasound, than would have occurred otherwise. I am excited about using this modality in the future for the management of soft tissue injuries." "Tendon injuries ... resolve much faster than normal." "After treatment our polo pony, Poppy competed all season in England and Ireland without any problems." Robert treated his horses both before and after competitions at WEF 2006 and won Grand Prix's and other major classes, while keeping his horses healthy and sound. Tim did the same and won a Major Grand Prix on Omali, besides other high placings at WEF. The 2004 Olympic Bronze Medal Three-Day Team Member and 2003 Individual Gold Medal winner at the Pan Am Games used our Spa while at Fair Hill International in Maryland and was thrilled with the results. He said his horses legs never looked better. He placed high in the ribbons at the Event. Sue is a former Show Jumper and owner of both show jumpers and racehorses, has been successfully using the horse spa at her farm in Canada on her horses with great results. The training and rehab facility in Centerville, Texas, is having great results with the Hydrotherapy Spa. 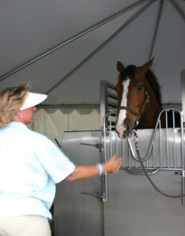 The horses are loving the treatments and the Veterinarians and the trainers are loving the results.